After jet-setting from New York to London and then Paris, Olivia style throughout it all has been impeccable. Styling for every occasion and season - from frosty New York to spring sunshine Paris. One of my favourite accessories worn by Olivia are her fur scarves, as seen on the far right, I love how she styles them so differently - adding a Russian Aura to her looks. Here are a few of my favourite looks post fashion week. 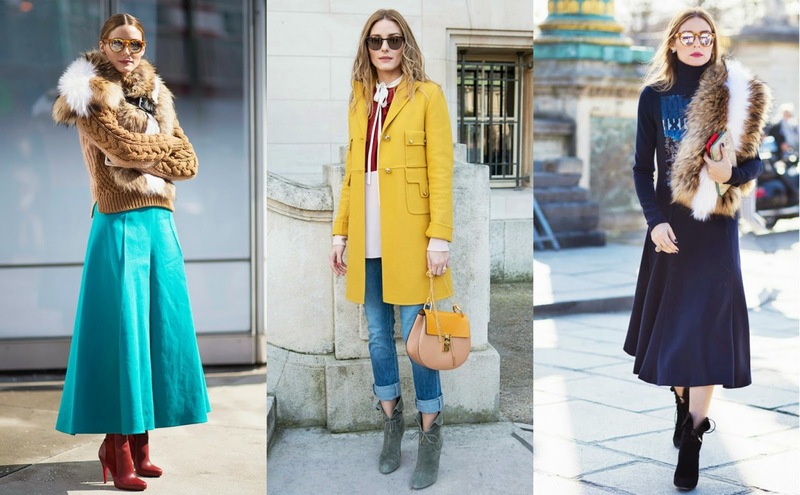 After personally attending London fashion week, a key blogger style I noticed was 70's inspired outfits, as seen on the far left by Olivia - Whether it be A-line skirts or boots, suede is definitely in this season! Also, during fashion week, you can never go wrong with wearing a little bit of white. You could ever wear white head to toe as seen in the far right and look super chic. I've also personally decided to add a few more white pieces to my Spring wardrobe, with a new coat purchase from New Look. None the less, it's clear that Olivia triumphed with her style power throughout the past few weeks, and to top of all her looks, check out her lush arm candy to top off the look!